If you want to do the workouts with weights more than the number beside the muscle icon feel free to do so but you should only workout with weights no more than 3 times a week. The goal of PHASE 1 is to basically get you started doing some simple physical activities to lose weight. Now it's time for you to start walking a little faster, playing a little harder or maybe even getting out of the house more by going to parties where dancing is involved! Get ready to burn more calories & lose more weight in PHASE 3! 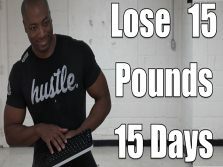 This may be your first real challenge on this program but remember the easiest way to lose weight on this program is to pick only the workout activities you like doing. Walking fast at 4mph (high intensity) for 35 minutes & then walking slow at 2mph (low intensity) for 20 minutes is an example of a workout in PHASE 4. You may Run for 30 minutes at a moderate intensity before you go to work in the morning and then come home and play with your kids for 30 minutes after you get off work. This may be a tough phase for you but hang in there. Once you see the results you'll know that all the hard work was worth it. Let the thought of losing weight help motivate you while doing your workout activities! In PHASE 7 you do 2 workouts that are done at different times during the day just like in PHASE 5 but in PHASE 7 both activities have to be done at a moderate or high intensity only just like in PHASE 6. The perfect diet for beginners who can't resist salty, sugary & fatty foods but still want to lose weight. Use this plan if you hate counting calories or simply don't have the time to do so. Do this plan to lose your last 10 lbs. I’m on phase 2, and it has helped me so much. I’m thinking ahead to when I get done with phase 7, do I start over at phase 1 and continue until I reach my goal weight, or continue doing phase 7 over and over til I hit my goal weight? Either way I am so ready to do this!! I would like to lose as much weight as possible for my daughters wedding next year. I weigh 279 and I have until July 2019 to lose as much as possible. What program to do suggest? I'm 5'6" - currently about 155lbs, struggling to build muslce & lose 20-25lbs by my February wedding (sooner if possible!) I drink tons of water, I eat a salad with grilled chicken just about every day for lunch (olive oil/vinegar dressing), I drink protein/meal replacement shakes for breakfast, watch my portions at dinner (& limit carbs where I can..) and try my hardest not to snack on anything after 7pm. I also recently started lifting some weights and doing light cardio about 2-3x per week - but I can't shake a single pound! Please give me some tips as to how to speed up the process or tell me what I'm doing wrong?? I am not big on drinking water, actually I hardly ever do. Please help me get on the road to a better health. I am a 54 year old female. I have a 40hr a week job as a nutritionist assistant, mostly pushing a food cart. I would love to be 122 by the end of July. I now weigh 180. I do very little walking or other exercise beyond that. I do have some body resistance workout equipment and some dvds0.0. I must not be eating the best correct foods, but I do not get any extra platefuls.What can you do to let me help myself to lose these almost 60 pounds ? Hello, I am 199.6 pounds and 5'2 and I am almost 15 and want to lose weight before I get fitted for my quinceneara dress, what can I do?? I'm 24, 5'2, female, and weigh 175 lbs. I'll be getting married in August or September. We haven't set a date. My fiance is leaving for army bct on the feb 20th. I want to lose 40 pounds (though I worry that I'll look too thin at 135). I want to be confident and happy in my new life. I just can't stay focused and motivated. I have scoliosis which causes back and knee pain but I'll push through it if it means my man's jaw hits the floor when he comes home. Please help me out. Thank you for your generosity of of service! I am grateful. 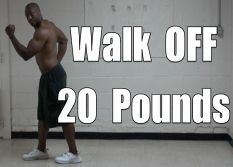 I have gained 30 pounds since rheumatoid arthritis became very severe; prior I walked 6 miles a day. Most is on my stomach back and arms, a little on the rest. I can’t walk, really. I am allergic to dairy for the whey shakes but right now eat mostly fruits and veggies, little protein. I would be grateful for your advice. I miss the rhythm of walking. so what about bikes or ellipticals thats no impact? I’m 5,11 and weigh 239 what should I do to lose weight a little quicker. 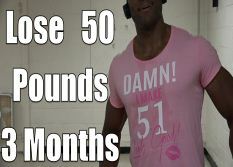 i have a little more than 60 days to lose 30 ibs. Im a 16 yr old girl, my weight is 190 and im 5'8. What can i do? Hey Adrian boo! listen, your workout is awesome hun. I do the 30 min F-BEING FAT LOL! workout and you are so encouraging I do that twice a week and run 1 day out the wk too. I was 208lbs I lost 18lbs I now weight 188lbs and seem to be stuck I want to loose, no I need to loos "feel me" 43 more lbs.... I do water fast 1 or twice every 2nd or third month for about a week with vitamins things to help detox and cleanse my body??? I seem to be stuck at 188LBS I seem to have some stress...I am trying to eliminate Im very active person women I play basketball.... I mean when I can I just (ANY SUGGESTIONS) please inbox me or let me know. You are THEE BEST COACH!!!! Thanks fir sharing this multi-million life change with all. What phase(s) di you recommend fir injured person's? (Healing from broken arm). Yes I do understand that you are not the doctor! What has been or do you expect the average weight loss total at the end of 95 day plan? I am 43 year old man having 98 KG weight and height is 5-6". I am patient of gout arthritis (pain in both foots joints) so can't run fast (but walk slowly), jumping jack (when try then start pain in my foot, ankles, knee and hip joints) or any other intensive workout. So please suggest to me how to reduce weight and what is better workout for me. Hi I am a 36 year old female weighing about 340. I am 5'6 and extremely desperate to loose at least 50 lbs. I am not good at dieting since I am a horrible picky eater. Please help I am really desperate. then have yu seen this? I want to lose 30 pounds in 60 days. Can you please tell me which plan to follow. Hi i am 27 years old and have 2 monthd old baby. O had c section. I am breast feeding my baby i am not sure how much calories i need in a day to lose weight. I put on too much weight during my pregnancy. My height is 5.3 and current weight is 169lbd.Pre pregnacy weight was 127 lbs. I already started work out at home form last 2 weeks but there is no change in my weight. Help me out with weight loss, deit and excersie. I am 38, 5’9”, 212LBs and have a back injury that requires surgery. I’m avoiding the surgery due to the risks being greater than good. What can I do to get some good exercise? I truly Am truly limited to about a mile of walking. have you seen this for options? Please guide me , i have come here with a deep hope that i could lose weight. What if you do step 7 everyday? I'll work very hard just need your advice/tips of what diet I can do and what physical activity I need to be doing. I'm insulin resistant with PCOS. I prefer workouts that don't require going to the gym since I don't have enough free time to do that. Do you take any rest days on this program or is it just 95 days straight?